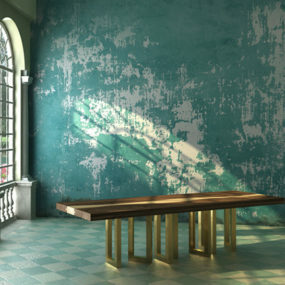 The organic and minimalist aesthetic of the LAX collection really appeals to us. The lines have purposely been kept so simple to contrast the hustle and bustle of everyday life, to provide a calming effect when you come home and close out the rest of the world. And indeed, it was conceived in the largest city in the United States, and brought to life in the second largest, Los Angeles. And thus the LAX moniker, after the Los Angeles airport. 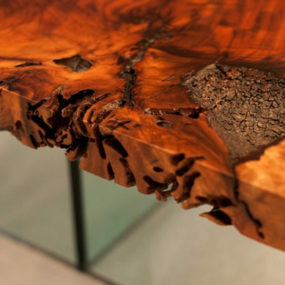 We’ve covered this line of English Walnut furniture in the past but with new additions, it’s time to have another look. Especially since the new furniture will fit seamlessly into small lofts or apartments – but don’t let that stop you if you’ve got a larger home, it will work there also! All designs are made locally by master craftsmen to contribute to the local economy and to minimize environmental impacts of transportation. 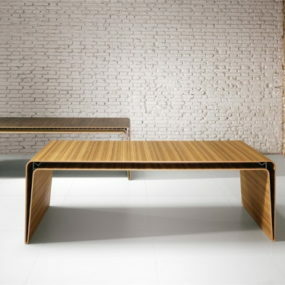 In addition, MASHstudios materials are meticulously selected for their positive environmental impact. 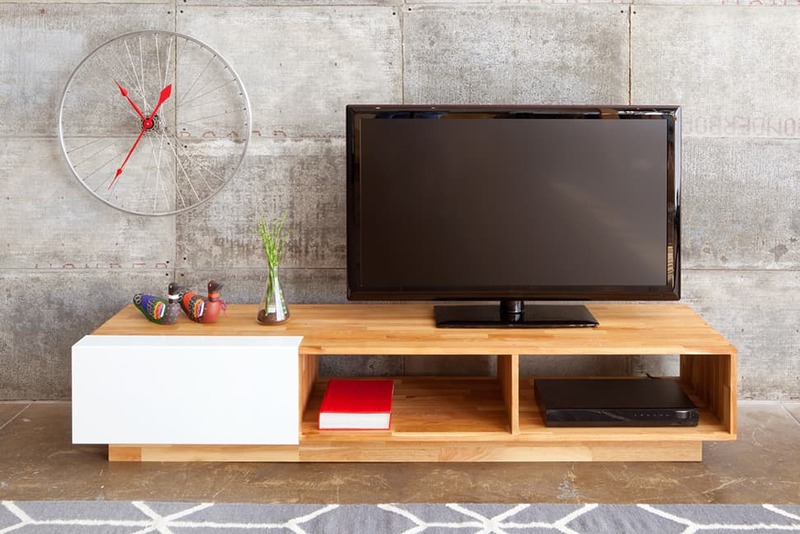 The low version of their entertainment shelf (above) has three compartments for storage and a sliding aluminum front. 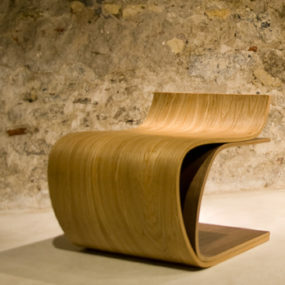 The grain in the wood has motion and flow – this piece screams style but in a subtle and gentle way. Perfect for your television – but you could also use it to hold your music collection. Wouldn’t it look great with a turntable on top? 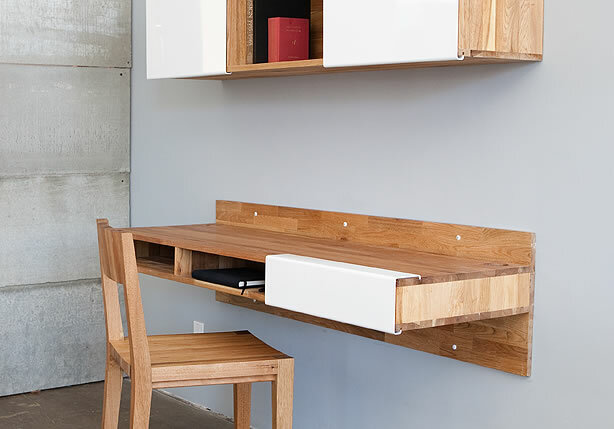 The LAX wall-mounted desk is just perfect for apartments or small spaces, or anywhere you’d like to minimize your footprint. 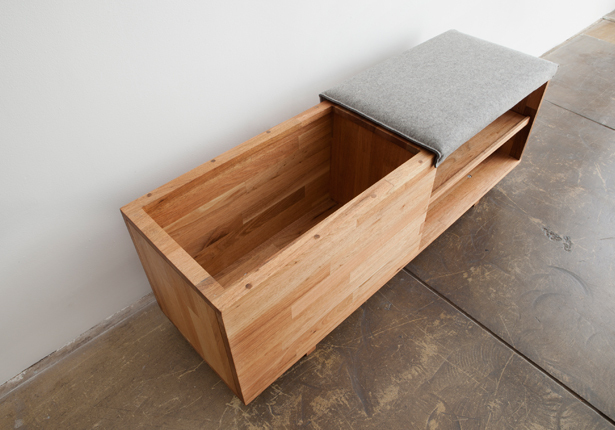 Cubbyholes strategically placed under the desk top means you don’t need drawers. 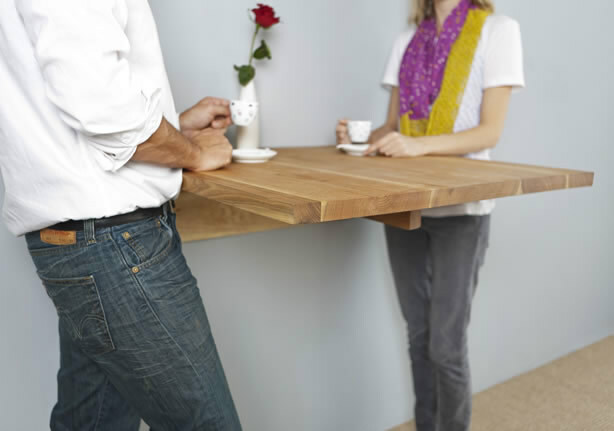 The wall mount means you don’t need legs – leaving you a lot more room for your legs under the desk. The sliding white aluminum panel means you can hide your papers and pens from sight. 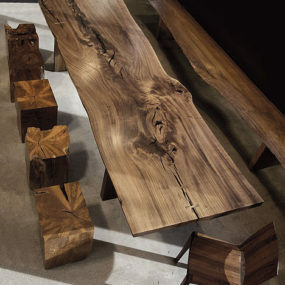 And as always, the gorgeous lines in the wood make this an unmistakeable piece of fine design. 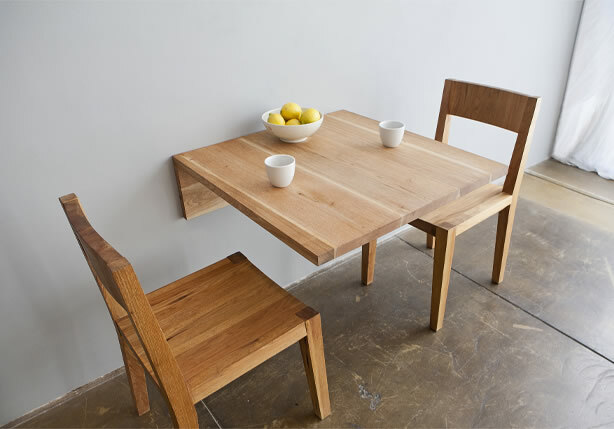 The wall-mounted dining table is another piece of clever innovation for small spaces. But don’t let that hold you back if you have a larger house – everyone should maximize the space they have! 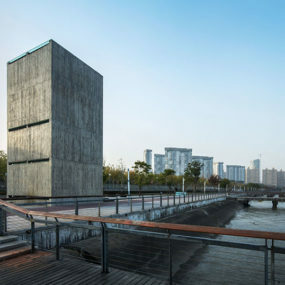 The surface is solid and stable – a unique steel mounting system accomplishes this. And doesn’t it look fantastic with no legs to interrupt the flow of the design? 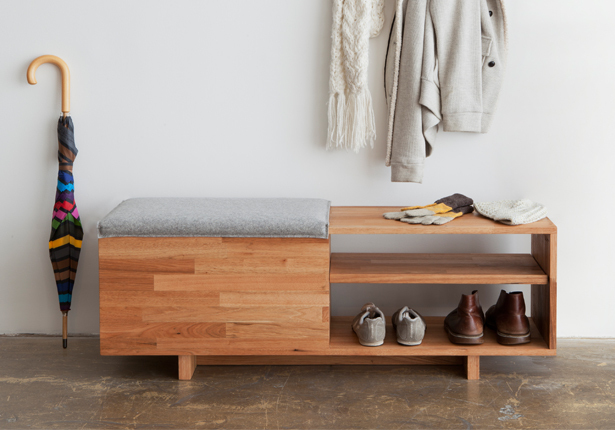 The sliding felt seat on this gorgeous storage bench holds all of your items out of sight. And there are two open shelves — for your shoes, hats, gloves, anything you want faster access to! 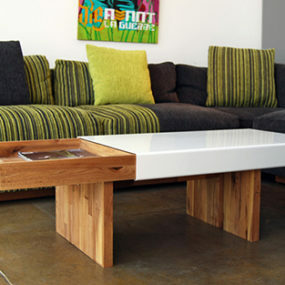 Staying in sync with the clean, light design – this contemporary style furniture has style in spades. 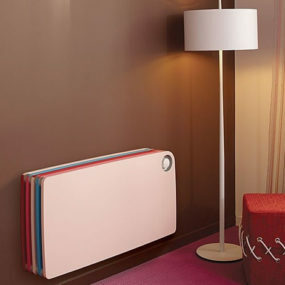 If modern and sleek is what you seek – look no further than LAX from MASHstudios. 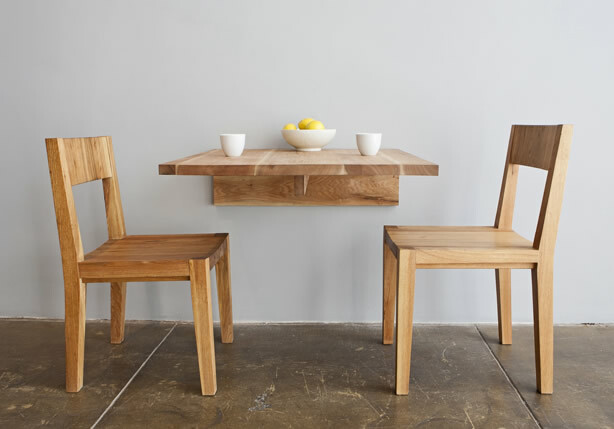 You can set your wall-mounted dining table at bar height or table height, it’s all up to you!